Yarn: Chunky size 6 in White or off white,Brown or coffee looking yarn size 6. Row 1: Put White yarn onto hook with a slip knot. Chain 38, join together with slip stitch, ch 3, do not turn Row 2: DC in 3rd chain from hook, DC in each chain around Slip stitch into top of chain 3 DC. Row 3-8: ch 3, DC in 3rd chain from hook and in each DC around slip stitch in top of chain 3 DC . Row 9: Chain 3, DC in each of next 3 stitches, DC 2 tog, *DC in each of next 4 stitches, DC 2 tog,* repeat from * ending with DC to end of round , slip stitch into top of ch 3. Fasten off. Ch 14, DC in 3rd ch from hook and each ch across , turn. Row 2-6: ch 3 DC in each DC across, turn. Fasten off leaving an 18 inch tail. Ch 2, sc 6 times in first ch, sl st first and last sc together. Round 2: 2 sc in each sc around, join with sl st. It may be helpful to use stitch markers now. Round 4: *sc in next 2 sc, 2 sc in next sc. Repeat from * around, slip stitch to beginning sc. Round 5: *sc in next 3 sc, 2 sc in next sc. Repeat from * around, slip stitch to beginning sc. Round 6: *sc in next 4 sc, 2 sc in next sc. Repeat from * around, slip stitch to beginning sc. Fasten off, leaving a 17 inch tail. Handle : Roll handle up lengthwise. 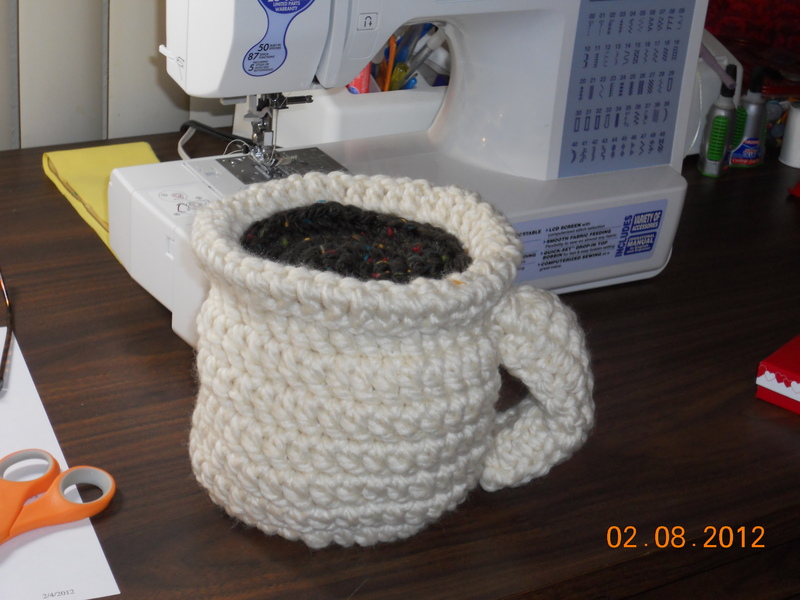 Put the tail through the eye of a yarn needle and starting at the top attach handle to cup and then sew handle together all the way down to the bottom and attach near the 7th or8th row on the cup. Knot off and weave in ends. Coffee: Thread tail through yarn needle and just below the brim begin to sew back and forth between the coffee and the cup all the way around. Knot off and weave in ends.